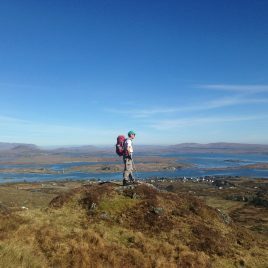 Walk Connemara offers guided walks, trekking, hill-walking, hikes and walking tours in Connemara and adjacent areas. These are provided by Paul Phelan, a qualified and experienced walking guide and author of the book “Connemara and Mayo – a Walking Guide”, published by the Collins Press. A guided hike with Paul, or one of ‘Walk Connemara’s ‘ team of qualified guides is an unforgettable experience. Walk Connemara offers various types of walks and tours. The walks range from gentle half-day strolls to full-day mountain challenges. Visitors can hire a private guide for an exclusive, customised experience, or occasionally there are scheduled walked that individuals and small groups can join. Please visit ‘Walk Connemara’s ‘ website for more information. Connemara is a walker’s paradise. Coastal walks include beaches, dunes, rocky shores, a fjord, cliffs and tidal islands. The islands of Inishbofin, Inishturk and Clare Island offer outstanding walking and interaction with the small resident communities. Easy Connemara hill walking ranges from the gentle bog slopes of Cnoc Mordain to small rocky peaks e.g. Errisbeg, Cashel or the Diamond trail in the Connemara National Park. Connemara also offers challenging rugged mountain hikes such as the Twelve Bens and the Maumturks, while Mweelrea and the Sheefreys are nearby in Mayo.